The first thing that struck me watching Obama’s speech in South Africa on the 100th anniversary of Nelson Mandela’s birth, was what was missing: There was no self-praise and no name-calling. Obama has a far better claim than Trump to being a “very stable genius,” but he didn’t call himself one. The sentences were complete and sonorous — and probably written by the speaker himself. (Imagine Trump writing anything longer than a tweet — and even those are full of mistakes.) The tone was sober and high-minded, even if listeners could read between the lines a withering critique of Trump’s policies. -- Max Boot, who said he was moved nearly to tears by his eloquent defense of a liberal world order that President Trump appears bent on destroying. “I never thought I’d live to see this! Neither the USSR nor Russia, who tried many times to drive the wedge between transatlantic allies, but the main player, Washington, and President Trump himself is doing everything to break down the foundations of transatlantic alliance and unity.” -- A translated clip from Russian state-run television that has gone viral in progressive media circles showing a Russian commentator marveling at Trump’s trashing of NATO. “One of the most disgraceful, remarkable moments of kowtowing to a foreign leader by an American president that anyone has ever witnessed. It wasn’t just that it was a kind of surrender. This is dangerous. The president stood there and did not defend our country.” — Former Secretary of State John Kerry, in an interview on Face the Nation, on Trump’s news conference with Vladimir Putin. “So President Obama knew about Russia before the Election. Why didn’t he do something about it? Why didn’t he tell our campaign? Because it is all a big hoax, that’s why, and he thought Crooked Hillary was going to win!! !--Trump back to calling the Russia investigation a Hoax he accepted the findings of U.S. intelligence agencies that Russia interfered in the 2016 presidential election. “I’m very concerned that Russia will be fighting very hard to have an impact on the upcoming Election. Based on the fact that no President has been tougher on Russia than me, they will be pushing very hard for the Democrats. 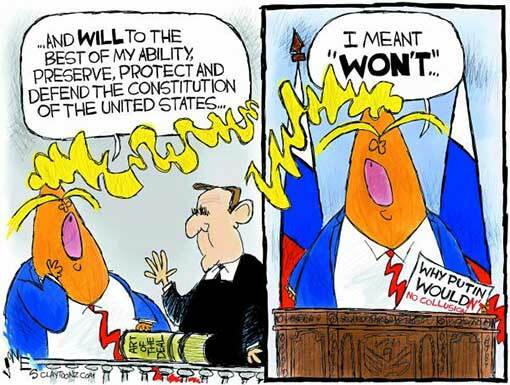 They definitely don’t want Trump!” — Trump, lying on Twitter. “We’ve gone from being the party of Jeb Bush Republicans who can win everywhere and over perform in Democratic areas to the party of red hat Cletus the Slack-jawed Yokel and QAnon. 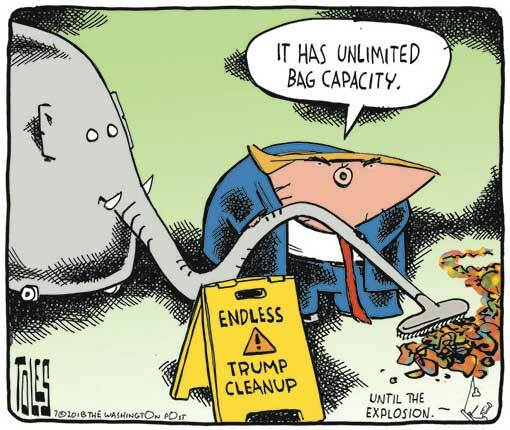 Who thinks this is going to end well?” — A Republican political operative, quoted by the Tampa Bay Times. In a series of early-morning tweets on Sunday, Donald J. Trump demanded that the Russian national anthem be played before every National Football League game and that all N.F.L. players stand during the performance. Seeming to double down on his demand, Trump tweeted that all N.F.L. players must remain standing while the color guard unfurls the flag of the Russian Federation. 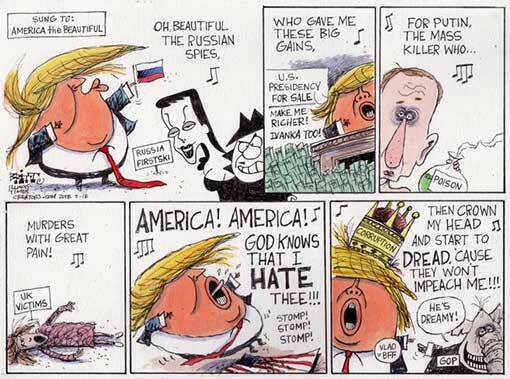 Trump’s insistence that football players stand for the Russian anthem appeared to come as a surprise to the director of National Intelligence, Dan Coats, who first heard about it while appearing at a security forum, in Bethesda, Maryland. A new Axios/Survey Monkey poll finds 79% of Republicans approve of President Trump’s performance during his meeting with Russian President Vladimir Putin while just 18% disapprove. One month of Secret Service protection for Eric Trump and Donald Trump Jr. cost taxpayers close to a quarter of a million dollars last year, according to new spending documents obtained by a watchdog group. The president’s sons traveled overseas for Trump family business on two trips that cost the Secret Service nearly $250,000. Taxpayers footed the bill for hundreds of thousands of dollars in hotels, airfare and other costs for Secret Service protection, according to documents obtained by nonprofit Citizens for Responsibility and Ethics in Washington. New York is opening up a new front in its legal battle against the Trump Foundation. After a nearly two-year investigation, New York State Attorney General Barbara Underwood filed a civil suit against President Trump and his three oldest children last month, accusing their charity of violating campaign finance law, of self-dealing, and of illegally coordinating with Trump’s presidential campaign. Now, the state has opened an investigation into whether the Trump Foundation violated state tax laws, which could lead to a criminal referral for possible prosecution. According to the New York Times, state officials would not say when the Department of Taxation and Finance opened its investigation, or what specific activities are being examined, though the issues will likely overlap with Underwood’s suit. As the post-summit fallout continues, however, these foot soldiers of the deep state are coming to a chilling realization: nobody has any control over Trump—including Trump himself. 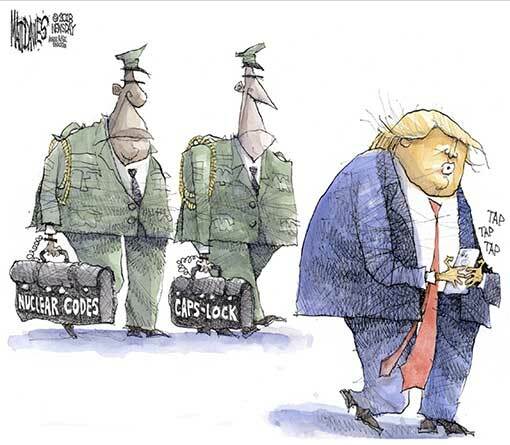 For the legion of national-security, diplomatic, and military officials trying to smile while white-knuckling through the Trump presidency, Helsinki was a wake-up call. As a current administration official explained, Trump seems to believe that he alone can sit down with dictators and strongmen like Putin and Kim Jong Un to remake the world order—and experts and advisers will only slow him down. 11. Russian operatives blasted 18,000 tweets ahead of a huge news day during the 2016 presidential campaign. Did they know what was coming? Huge, immediate gains for wealthy shareholders combined with tepid increases in business investment and decreases in real wages don’t paint a flattering picture of the tax cut’s impact so far. There is, however, a possibility that the tax cut has acted as a Keynesian fiscal stimulus, helping to push down unemployment. Sen. Kamala Harris has not officially said she is running in 2020, but she hasn’t denied it, either, and she’s showing many of the signs of someone who is preparing for a run, including campaigning for her Democratic colleagues in key races and signing a deal to write a book. The Californian ranks low in polls of the potential Democratic 2020 field, and she doesn’t have the name recognition of other contenders. (Her first name is still widely mispronounced — it’s COM-ma-la.) But betting markets have her near the top, reflecting the view among political insiders that Harris could win the Democratic nomination with a coalition of well-educated whites and blacks, the way Obama did in 2008. 19. How to win a Trade War. Larry Sabato’s Crystal Ball:“Democrats are now a little better than 50-50 to win the House. This is the first time this cycle we’ve gone beyond 50-50 odds on a House turnover. With a deadline to reunite separated migrant families only days away, the Trump administration admitted in a court filing Monday that 463 parents are no longer in the U.S. and have possibly been deported, leaving them ineligible for reunification with their children. That deadline will almost certainly be missed. The government insists that all parents who’ve been deported were given the option of taking their children with them, but some immigration advocates are questioning whether the parents knew what they were agreeing to. In its own filing Monday, the ACLU asked U.S. District judge Dana Sabraw to force the government to produce a list of parents who agreed to be deported without their children. “These parents urgently need consultations with lawyers, so that they do not mistakenly strand their children in the United States,” the filing said. Donald Trump’s bailout for the ag industry is driving his many Republican trade critics to exasperation. Pro-free trade Republicans were already furious with Trump's escalation of tariffs against U.S. allies and China — a multi-front trade war they say is hurting U.S. farmers and manufacturers. 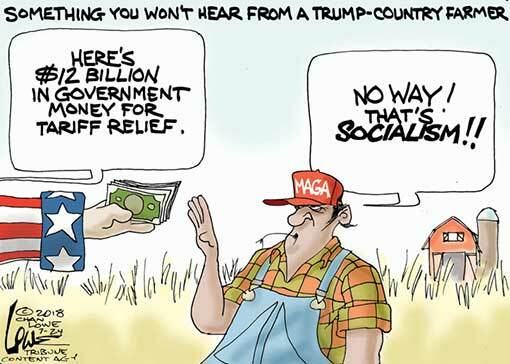 But the administration’s response Tuesday — announcing plans to send $12 billion to farmers hurt by retaliatory tariffs to ease the pain — is the opposite of conservative, free-trade orthodoxy, they said. The combination of the auto tariff threats and the duties on steel and aluminum Trump's already imposed is driving major trading partners away from compromise rather than towards it. A two-day meeting of the G20 ended this weekend in deadlock and grim preparation from European countries for future retaliation of their own. Few major Western countries are interested in any new one-on-one trade deals with America so long as the previous tariffs remain in effect. The president of the United States has now, twice in the span of 18 months, unsubtly threatened genocidal violence against another country. The latest threat came late Sunday night, in an unhinged-sounding all-caps tweet that almost immediately ranks — along with Ronald Reagan's "we begin the bombing in five minutes" gaffe and JFK's Cuban Missile Crisisspeech to the nation — as among the more alarming presidential communications in history. Trump wrote: "To Iranian President Rouhani: NEVER, EVER THREATEN THE UNITED STATES AGAIN OR YOU WILL SUFFER CONSEQUENCES THE LIKES OF WHICH FEW THROUGHOUT HISTORY HAVE EVER SUFFERED BEFORE. WE ARE NO LONGER A COUNTRY THAT WILL STAND FOR YOUR DEMENTED WORDS OF VIOLENCE & DEATH. BE CAUTIOUS!" Rouhani's offending threat came in a speech on Sunday to Iran's diplomats, in which Rouhani warned America, essentially, not to meddle in Iran's affairs. "America should kn ow that peace with Iran is the mother of all peace, and war with Iran is the mother of all wars," Rouhani said. It wasn't a pledge of nonviolence, certainly, but it wasn't an offensive threat, either. Instead, it was a warning of the kind that nations routinely make when they perceive threats gathering against them. It’s hard to identify a Senate or House seat that is being lost because of excessive Democratic activism. Even if a Democratic incumbent like North Dakota Sen. Heidi Heitkamp is troubled by calls to ax ICE, there is scant evidence that this makes her more vulnerable than before in a state that Donald Trump carried by better than a two-to-one margin. For a party supposedly riven by unbridgeable chasms, the Democrats survived the primaries without major stumbles. This year, there are no Democratic challengers in winnable seats who have been forced to go on television to explain, “I am not a witch.” And in California’s top-two “jungle primary,” the Democrats avoided squandering any potential House pickups by making sure they got a candidate onto the ballot in all contested districts. 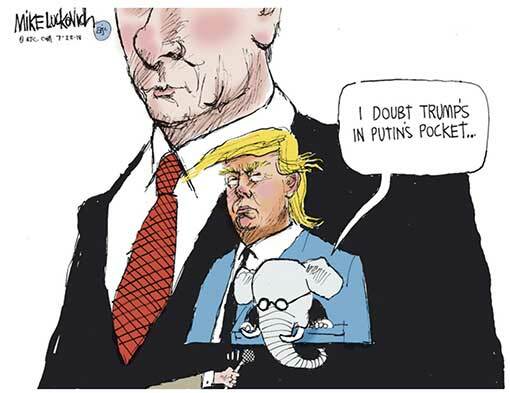 A new NPR/PBS NewsHour/Marist poll conducted after President Trump’s summit with Russian President Vladimir Putin finds 64% of Americans don’t think President Trump has been tough enough on Russia, including 47% of Republicans. A new Quinnipiac poll finds that 38% of voters approve of how President Trump is doing his job. Meanwhile, Trump’s tax cuts have done little to stimulate economic growth or improve workers’ wages. “Worker pay in the second quarter dropped nearly one percent below its first-quarter level,” reports CBS News. The New York Times notes that “[h]ourly earnings have moved forward at a crawl, with higher prices giving workers less buying power than they had last summer.” Corporations have largely used the windfall to repurchase their own stock, spending nearly $700 billion in “buybacks” that boost company value and produce profits for shareholders and senior executives. 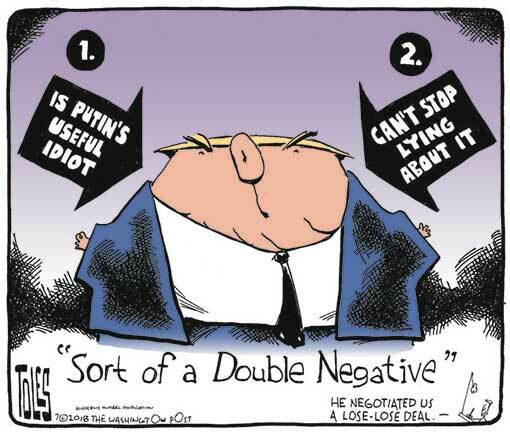 Now that Trump has failed to pin his historic calamity on a misplaced “double negative” and turned the confusion of the words “would” and “wouldn’t” into an international punch line, scapegoating will inevitably be his next tactic. In tweets Wednesday morning he was already back to bragging about what a triumph his Putin meeting was, and essentially disowning yesterday’s “clarification” (a.k.a. 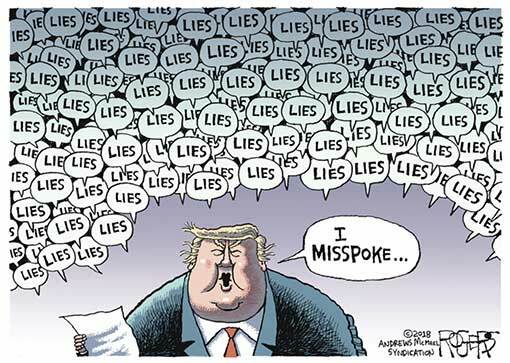 “lie”) about what he meant to say while standing beside the Russian thug in Helsinki. 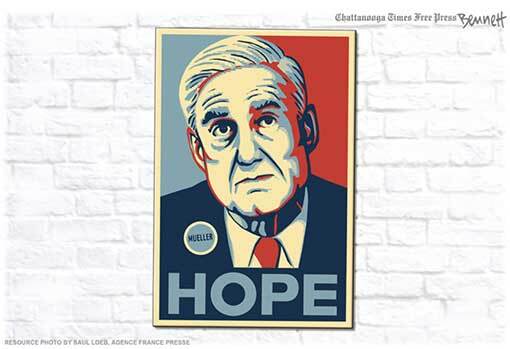 But, truly, only his base will believe that it’s all Crooked Hillary’s fault or Obama’s or Comey’s or Mueller’s or Rosenstein’s. Nor will history now go on holiday while he marshals whatever foolish defense he alights on next. As with a rotting fish, the stench from President Trump’s execrable performance in Helsinki only grows more putrid with the passage of time. The leader of the sole superpower was simpering and submissive in the face of a murderous dictator’s “strong and powerful” lies. It is ludicrous to pretend that changing “would” into “wouldn’t” might have changed Trump’s message, which included a conspiratorial rant about the FBI and not a word of specific censure of Russian crimes. Having committed a “Kinsley gaffe” (i.e., saying what he really thought), the president couldn’t bring himself to convincingly read the “clarification” concocted by some over-clever spinmeister. He felt compelled to add that the election “meddling” could have been the work of lots of “other people” besides the Russians, thereby negating the point of the exercise. When I wrote, back in February, that I was skeptical that President Donald Trump would ever be proved to have secretly colluded with Russia to sway the 2016 election in his favor, I mistyped. What I meant to write was that I wasn’t skeptical. Last week’s events have nullified my previous skepticism. To recap: Deputy Attorney General Rod Rosenstein revealed indictments against 12 Russians for the hacks of the Democratic National Committee, and we learned that Russian hackers went after Hillary Clinton’s private office for the first time on the very day Trump said, “Russia, if you’re listening, I hope you’re able to find the 30,000 emails that are missing.” At the NATO summit in Brussels, Trump attacked a close European ally—Germany—and generally questioned the value of the alliance. Next, he visited the United Kingdom and trashed Prime Minister Theresa May. Then, in Helsinki, he met with Vladimir Putin privately for two hours, with no U.S. officials present other than a translator. 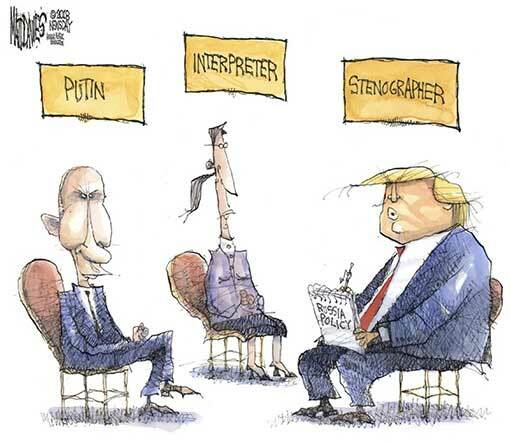 After this suspicious meeting, he sang the Russian strongman’s praises at a news conference at which he said he viewed Putin’s denials on a par with the unanimous and unchallenged conclusions of America’s intelligence agencies. 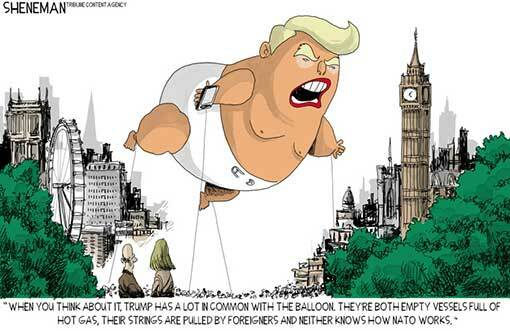 Everything Trump did in Europe — every horrifying, sick-making, embarrassing expostulation — is, in some way, consistent, and predictable, when you consider how he sees the world. It’s not a plan or a strategy as such. 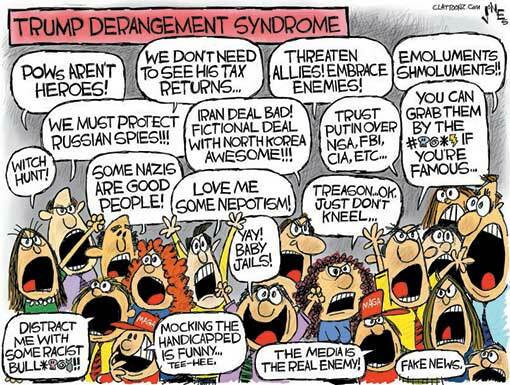 Trump is bereft of the attention span to sustain any of those. It is rather the reflection of a set of core beliefs and instincts that have governed him for much of his life. The lies come and go. But his deeper convictions really are in plain sight. And they are, at root, the same as those of the strongmen he associates with and most admires. The post-1945 attempt to organize the world around collective security, free trade, open societies, non-zero-sum diplomacy, and multicultural democracies is therefore close to unintelligible to him. Why on earth, in his mind, would a victorious power after a world war be … generous to its defeated foes? When you win, you don’t hold out a hand in enlightened self-interest. You gloat and stomp. In Trump’s zero-sum brain — “we should have kept the oil!” — it makes no sense. It has to be a con. And so today’s international order strikes Trump, and always has, as a massive, historic error on the part of the United States. Why are we then searching for some Rosetta stone to explain his foreign policy? Some evidence of his being a Russian asset? Some bribe? Some document or email proving his fealty to Moscow? Yes, it’s perfectly possible that he knowingly accepted Russian help in defeating his opponent in the last election, and is even now encouraging Russia to help him again. But that’s simply the kind of unethical thing Trump has done for years, without batting an eyelid. He sees no more conflict here than he did in seeking Russian funding and German loans for his businesses. 9. Charles J. Sykes: Republicans, Don’t Just Tweet About It. Do Something. Enough with the indignant press releases, strongly worded emails, disapproving tweets and mournful cable television appearances. Republicans in Congress need to realize that they are not merely constitutional potted plants. Despite mantras of impotence, the elected members of the party need to remember that they have the power to pressure the White House. And they can do it without derailing a conservative agenda. At that news conference in Helsinki, the world was confronted with an extraordinary stew of narcissism, appeasement, moral surrender and the chronic dishonesty that Republicans have been willing to tolerate for so long. But now the stakes are higher. In just a few days, President Trump undermined the global world order, weakened our alliances, cast doubt on our commitments to NATO, sided with Vladimir Putin over our own intelligence agencies and suggested that the Russians be allowed to interrogate a former ambassador to their country. Despite the attempted walkbacks, clarifications and various obfuscations about dropped contractions, the damage is real. 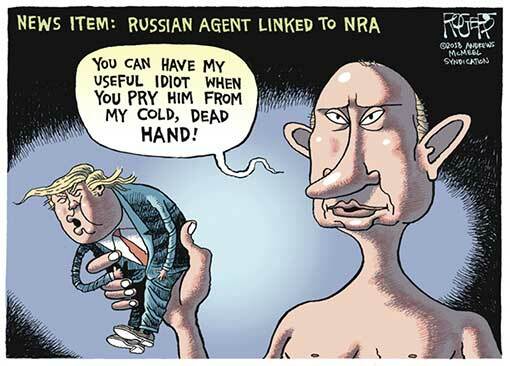 And now Mr. Trump wants Mr. Putin to come to Washington. The danger should be obvious. That’s why mere expressions of outrage simply are no longer adequate. Perhaps most important, Congress could reaffirm that no one, including the president, is above the law. President Trump’s disgraceful performance in Helsinki, Finland, and in the days since is an indication that he is not fit to remain in office. Trump’s 2016 “America First” platform might be more aptly named “Russia First” after the disaster that occurred last week. Trump’s turn toward Russia is indefensible. I am a lifelong Republican. I have campaigned and won as a member of the party, and I have served more than one Republican president. My Republican colleagues — once rightfully critical of President Obama’s engagement strategy with Russian leader Vladimir Putin — have to end their willful ignorance of the damage Trump is doing both domestically and internationally. We must put aside the GOP label, as hard as that may be, and demonstrate the leadership our country needs by calling on the president to step down. Yes I do. I hold both countries responsible. And I think we’re all to blame. It is impossible to imagine Reagan or, frankly, any other US president, giving that answer, and it is easy to imagine the outrage among conservatives if Barack Obama had uttered those words. This was not an errant tweet, or one of Trump’s random insults, outrages or assaults on the truth. Trump’s behavior risked undermining the global world order, alienating our friends and emboldening our enemies. Many Republicans have rationalized their support for Trump by pointing to tax cuts, rollbacks in regulation and Trump’s appointments of conservative judges. But last week reminded us how many of their values they have been willing to surrender. Moral relativism and its cousin, moral equivalency, are not bugs of the Trump presidency; they are central to its diplomatic philosophy. Unfortunately, polls suggest that many conservatives are OK with that, despite the betrayal of what were once deeply held beliefs. For years, Republicans derided what they saw as Obama’s fecklessness on the world stage, including what they called his “apology tour”. Trump, we were told, would change all of that by projecting strength and standing up for American values. Instead, we got last week’s parade of sycophancy and abasement. This summer, President Donald Trump has upended the basis of American security—opening a trade war with China, chastising U.S. allies in Europe, and, at a press conference in Helsinki, following a two-hour private meeting with President Vladimir Putin, accepting his claim that Russia did not interfere in the 2016 election. 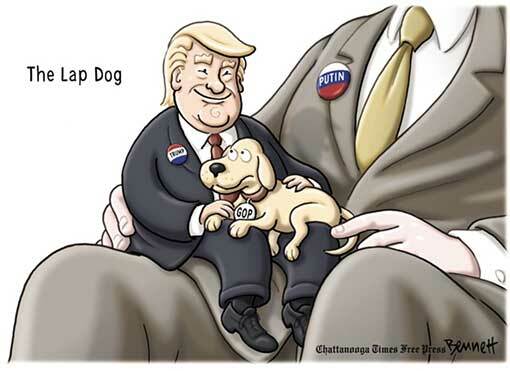 The Times reported that U.S. intelligence officials had presented Trump with evidence that Putin himself had ordered cyberattacks in an attempt to affect the electoral outcome. Just days before the Helsinki meeting, Robert Mueller, the special counsel, indicted a dozen Russian intelligence officers on detailed charges of hacking Democratic e-mail accounts. In a separate case, prosecutors also accused a Russian woman in Washington, Mariia Butina, of advancing a plot to influence the National Rifle Association. (Her lawyer has denied the charges.) 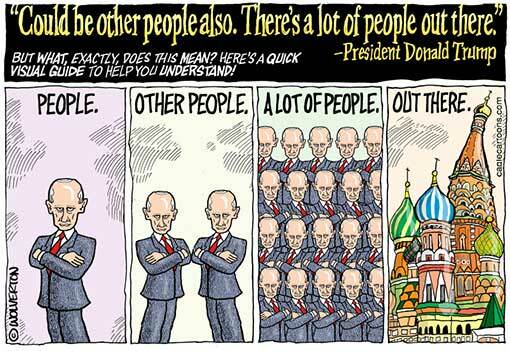 And still Trump praised the Russian leader. The most frustrating aspect of the backlash against President Trump’s servility to Russian President Vladimir Putin is that nothing that happened last week in Helsinki should have surprised us. What has changed is that so many who insisted in 2016 that Trump was not as bad as he looked, that he was a pragmatist at heart, and that we should take him “seriously but not literally” have been forced to face the truth. 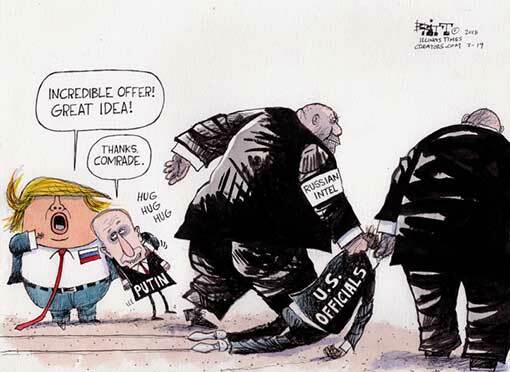 The truth is that Trump really does have what you might call a special relationship with Putin and Russia, for reasons still not fully known. He views foreign policy not as a way of protecting the nation but as an extension of his own narrow, personal interests. 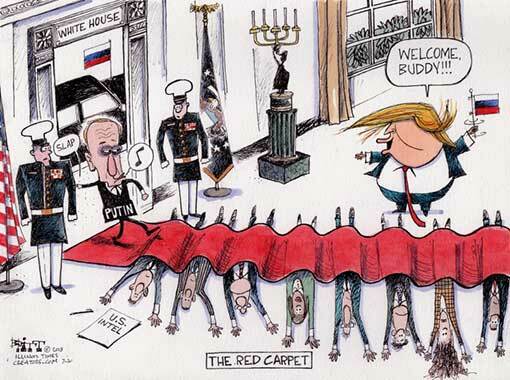 He has no respect for our basic liberties, which is why he entertained turning over our country’s former ambassador to Russia, Michael McFaul, and other Putin critics to the Russian dictator’s mercies until widespread revulsion required Trump to back off. The vindication of those who saw Trump for who he is (a majority of the 2016 electorate, it’s worth noting) provides little satisfaction because of the peril his presidency poses.